Use the Ejournals Database to determine if a journal is available online from the Library. Select the tab for "Ejournals" in the search box on the Library's website. Enter the name of the journal that you are looking for--not the title of the article you need from the publication. How do I find a journal title in a a citation?. Once you enter your search, the Ejournals Database will list all of the different Library resources that contain online issues of this publication. Be sure to check what years of a journal are available in each database. Some databases do not provide PDF full-text. 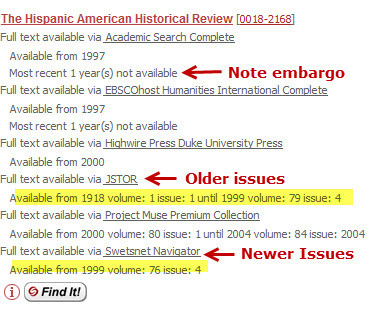 If you require pdfs, select the full-text option from a publisher or journal archive such as JSTOR. Some databases may have an embargo on recent issues. Any missing years are noted in the results list. To find the article, select the link for the database and find the issue you need. Or, click on the Find It! icon for links to full-text options.